When Jan made her bread pudding, her plan was to divide the recipe into two. One small pudding for our breakfast and another for dinner over at Miriam’s tonight. Because she slept in this morning, she did not think she would wait for the pudding to bake before she had to go to the gym. I suggested pancakes. I took part of the pudding mix and put it in a skillet. A slow fry on the stove top, quickly cooked it enough for her to have her bread pudding and eat it too. 1. Melt the butter a skillet over medium low heat. 2. Add the bread pudding mix and cover the skillet. Note: The pudding mix will very wet. Use a pan the same size as you want your pancakes to be. Large pan, thin pancake. Small pan, thick pancake. 3. Check the pudding after 4-5 minutes for burning on the bottom. 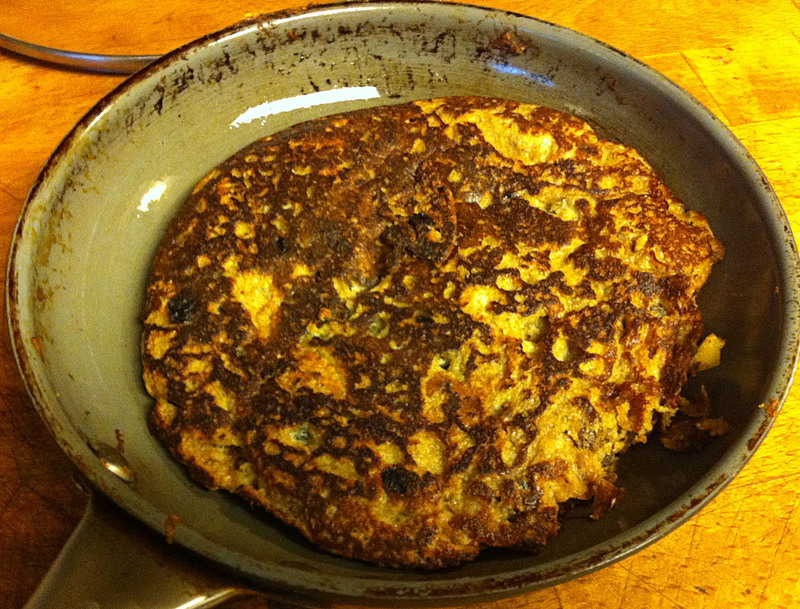 Tip: If the bottom is starting to scorch, move the skillet from the heat and “pancake flip” the pudding. Us a turner is this technique makes you nervous. 4. Return the skillet to the heat, cover, and cook for 4-5 minutes more, until the new bottoms is golden brown. Tip: You can make several more, but each pancake is enough to feed two.